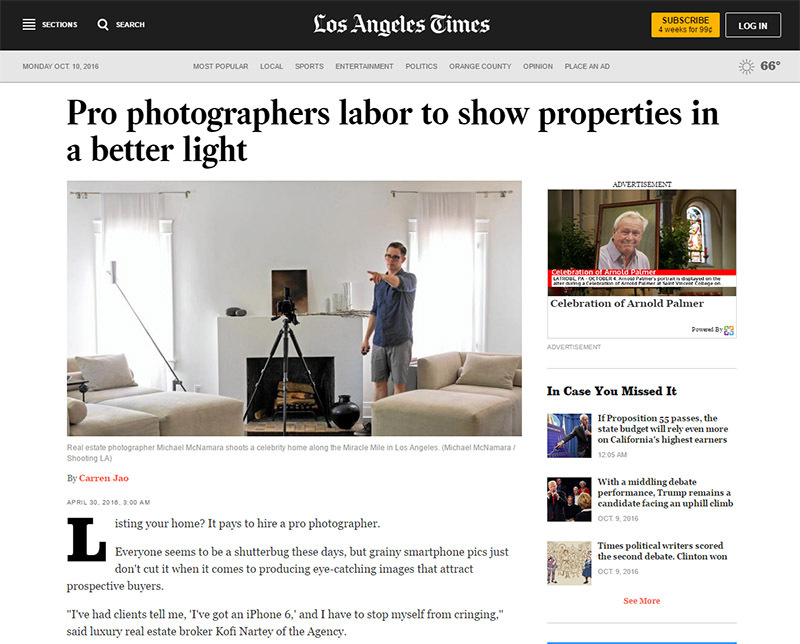 Iit is an interesting piece from the Los Angeles Times called “Pro photographers labor to show properties in a better light“. “Listing your home? It pays to hire a pro photographer. “I’ve had clients tell me, ‘I’ve got an iPhone 6,’ and I have to stop myself from cringing,” said luxury real estate broker Kofi Nartey of the Agency. Professionally photographed homes sell faster and for more money than homes listed with point-and-shoot photos, according to a 2013 Redfin study. The report found that for homes priced between $400,000 and $499,999, those with professional pictures sold for an average of $11,200 more than homes with amateur photos. They do go on to make some good points, and acknowledge that good quality photography – the kind that brings in benefits for the agent and the homeowner – is not going to happen at $65 a pop. As they point, some photographers charge “as little as USD 275.- for up to 20 photos for a one-hour shoot to several thousand dollars for an all-day affair.“, which is a fair comment. Of course, this is Los Angeles where photographers will charge more than they would in small town Idaho, but you get the point. “A good photograph makes someone interested in seeing the property. A great photograph makes them feel like they’ve been there,” said real estate photographer Erik Grammer. A good photographer knows how to showcase the interiors while capturing the view outside the windows. Sometimes that means using natural sunlight or bringing in artificial studio lights. Photographers said they use Photoshop to touch up photos for color or brightness, but most draw the line at removing pre-existing telephone lines or utility boxes. They also spoke with a photographer who pointed out that he likes to photograph a home at the best time of day, and I agree – I think that’s really important. Some real estate agents only want to do the photo shoot at a time that is convenient for them, even if that’s at 8:00am when the sun is low in the sky, the front of the house looks as black as death in the strong shadows, and the view is impossible to see because of the sun. That’s not how you impress a seller. A good agent, a really knowledgeable one, will coordinate their day with the best time of day to photograph that particular house, because they know that time of day matters. Mind you, some photographers don’t always get it right either, and will push to do a shoot that is convenient for them, whereas the booking of the photo shoot should, as much as possible, but at the best time for the photos. After all, that’s why everyone will be there, so you might as well make sure it’s going to be the best it can possibly be. Drones are another option, said Philip Coombes, who charges USD500 to $2,500 for a 2.5-minute drone video. A $3-million home in Malibu was faltering on the market for nine months until Coombes used a drone to capture its ocean view. “The house looked like an $800,000 property, but from 30 feet up you can see its 180-degree ocean view,” he said. “It looked like a very expensive part of Hawaii. You’d have never seen that from the ground.” The Malibu home was in escrow three weeks later.